This is a recipe devoted to Father’s Day, but would, could and should be delicious any day of the week! I really thought a lot about what a father might want on his special day, and a few things sprang to mind. Giant Steak. It must have a bone in it. It needs to be spicy. These just seem like the building blocks for a perfect Father’s Day Steak. Then … my own little twist … I love adding a little something sweet my meals. This one has a little bit of orange thrown into it. This is totally optional and may actually diminish the manliness wafting off the original list of Father’s Day qualifications, but I happen to know that sweet and acid both boost flavors. Manly-Man or not, it WILL taste better with a little orange thrown in to it. The basic idea is, we make a little rub from the orange juice and adobo in the can of chipotles. We rub it on the steaks, and then grill them. In a pan, we reduce beef stock, with garlic, onions, bacon bits, chipotles (throw some habaneros in there, if you really want to make a mark on Dad’s day!) and a little tequila. Let this simmer and reduce, then just before serving, whisk a bunch of butter into it, to thicken it up and add some brazen fat! 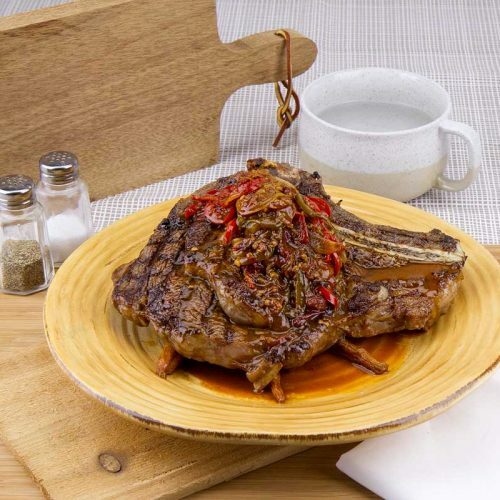 Serve the steaks, slathered in the flavorful, hot and spicy butter sauce! Dad will thank you for this one! Note: I highly recommend reading my tips on cooking a steak before proceeding. A few little thoughts might help take a steak from simply great, to history making! Inside the can of chipotles is a spiced tomato sauce called Adobo. Remove your peppers from the adobo, while saving the adobo. Slice the chipotles into thin strips, and then set them aside. Pour the remaining adobo into a large mixing bowl. Juice your orange, placing half in the bowl with the adobo and the other half on the side. Add cumin to the adobo and juice, then mix well. Add steaks to the mixture and evenly coat them with the chipotle rub. Leave the steaks sitting on the counter, for about an hour. We're both adding flavor and warming them up! While your steaks sit, prepare and pre-heat a hot grill. Heat up a large sauté pan over medium-high heat. Add about 1 tbsp of butter to the pan and swirl it around. Quickly follow with your onions and garlic. Move them around the pan until they are a nice golden color. Add your bell peppers and sliced chipotle peppers to the pan and continue moving it around. When this mixture starts sticking to the bottom of the pan, add your tequila. This will create a big cloud of steam. If you have a gas stove, you may want to turn it off before you do this, as it can create a ball of fire (which could be fun if Dad is cooking!). Stir in the tequila and turn the heat down to low. Allow the mixture to simmer for about 2 minutes. Add your beef stock, the rest of the orange juice and the bacon bits to the pan. Reduce by about 2/3rds. The sauce will NOTICEABLY thicken. Turn the heat down as low as it can go, while still staying warm. Dust the steaks with salt and pepper. Brush a little oil on the grill and place your steaks on the grill. Grill to the desired doneness and then set somewhere warm to relax for about 5 to 10 minutes. While the steaks relax, add a small piece of cold fresh butter to the sauce pan and swirl it around. When one piece of butter is about halfway melted, add a second piece of cold fresh butter. When that second piece is halfway melted, add a third piece. Keep swirling in the cold fresh pieces of butter, until it has created a lovely and luxurious spicy bacon jus. (this is done in this manner, so that the butter is incorporated into the jus, without simply melting and forming an oil slick on the top of the sauce. This slow cold swirling method emulsifies it into the stock in a method known as "Monté" (pronounced "Mont-tay")). Serve the steaks topped with the sauce! OMG! Next time I buy a ‘giant’ (giggle) bone in rib eye I’m doing this to it. Maybe ease back on the adobo or chipoltle because I want to taste the great meaty meat flavor. Not scorch my palate. The butter emulsifying directions are to me a no brainer but can’t speak for anyone else. Good that you explain it. I recently acquired a grill that runs super hot so this steak recipe will be the bomb on it. I agree the proper way to grill meat is to allow it to be room temp so thanks for pointing that out to some that may not realize this important step. Oh, have I mentioned I love your site? Woot.